When imposter supply teacher Dewey Finn asks his young students to demonstrate their singing ability, one of his charges bursts into Memory from Cats. “I never want to hear that song in this building again!” he exclaims, stopping her. But for 21 years, that song was heard nightly in this building – 35 years ago Cats received its world premiere here at the New London Theatre. 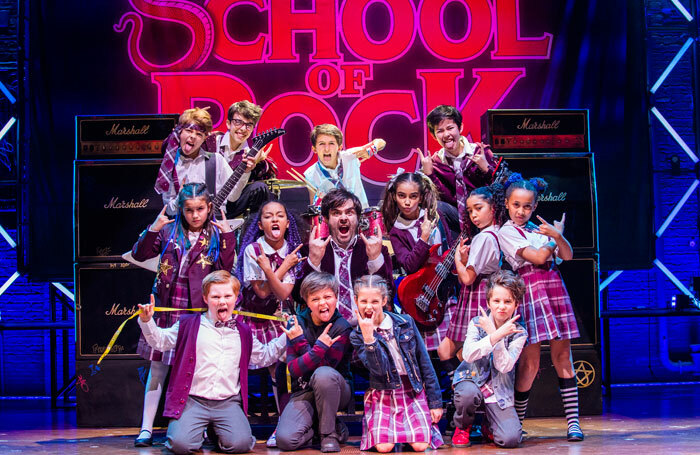 Now Andrew Lloyd Webber is back in residence with his freshest, funniest show since the youthful exuberance of Joseph and the Amazing Technicolor Dreamcoat, Cats and Starlight Express. It marks a significant break from the lush romanticism of musicals such as The Phantom of the Opera and the sometimes maudlin seriousness that pervades subsequent works such as Aspects of Love, Sunset Boulevard, The Woman in White and Love Never Dies. 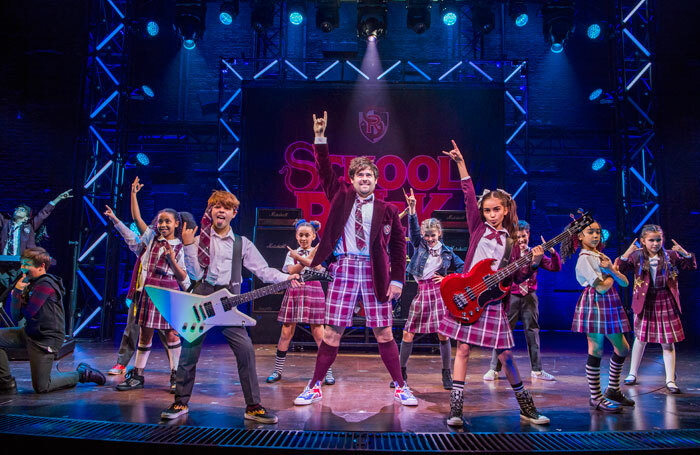 In fact, it feels as if Lloyd Webber has, at the age of 68, gone full circle, with a score boasting punchy retro-rock riffs that could have come straight from Jesus Christ Superstar, a show that premiered on Broadway in 1971 before arriving in the West End a year later. 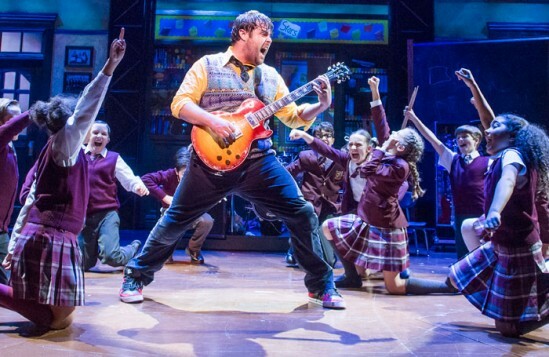 School of Rock has followed a similar path and becomes the first Lloyd Webber musical since Superstar to do so. This made both commercial and practical sense: not only because of its all-American subject, but also because it stars 13 child actors and New York’s legislation around child performers is less restrictive than the UK’s. All credit, then, to children’s casting director Jessica Ronane, children’s director Nic Greenshields and children’s music director and rock coach Sam Hall for their phenomenal work finding and training three sets of 13 astonishing child actors for the London staging. 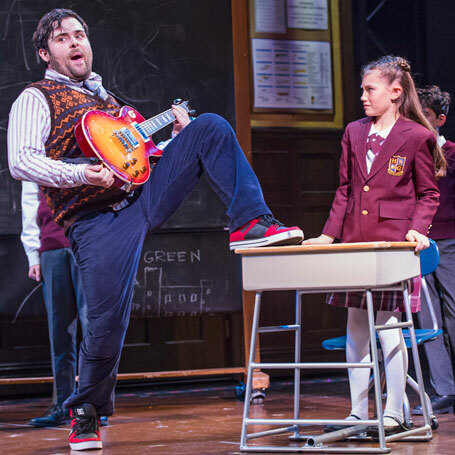 The kids play the variously uptight, upright students of the private Horace Green prep school, whose academic and personal lives are turned upside down by a supply teacher with a passion for rock music, when he coaches them to take part in a Battle of the Bands competition. All the children play their instruments live, including (at the performance reviewed) Toby Lee on electric guitar, Jude Karper-Wrobel on drums, Selma Hansen on bass and Oscar Francisco on keyboards. They are as quirky as they are individual, and I defy anyone not watch them rock without breaking into a great big smile. 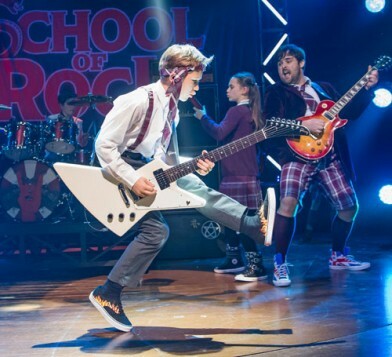 They are also, in every way, the equal of their powerhouse counterparts who I saw in the show’s New York premiere in December 2015 (where it was coincidentally playing at the original Broadway home of Cats). 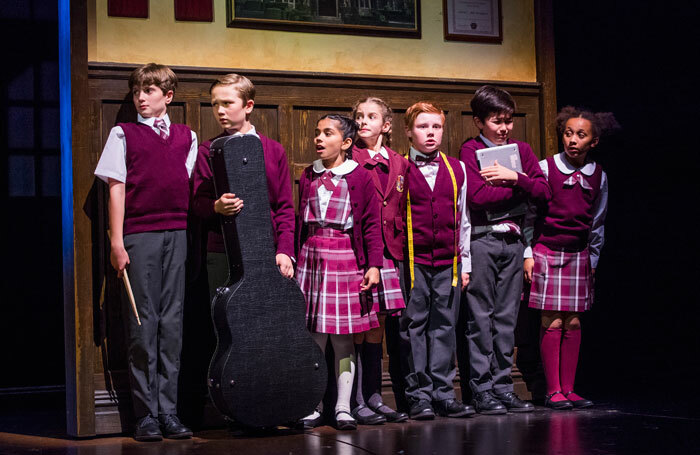 You expect New York stage kids to have the smarts; but these English ones also have an appealing deferential spirit that explodes into confidence when they find their musical legs. It may be a small gear change but it’s a cultural difference that plays to British strengths. 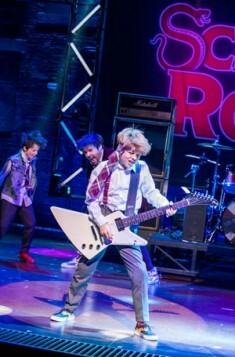 The show, based on the 2003 film comedy starring Jack Black, is also distinguished by a witty and appealing adult cast. 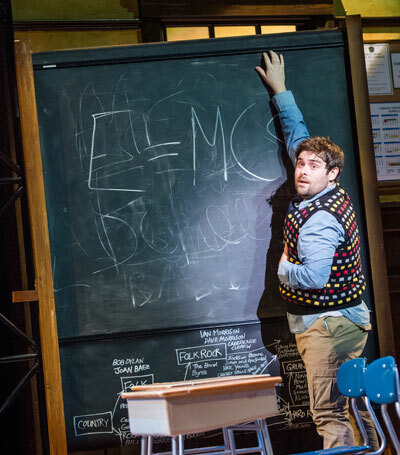 As Dewey Finn, David Fynn is perfectly cast as the permanently dishevelled accidental teacher, a pot belly constantly protruding from designer Anna Louizos’ deliberately unflattering coloured cardigans. He is a powerhouse of rock and comedy energy, with a lovable, unforced physicality. Florence Andrews shows off a great operatic voice as head teacher Rosalie Mullins, who harbours a secret passion for Stevie Nicks, as we find out when she eventually lets her guard down. Oliver Jackson and Preeya Kalidas, as Dewey’s unwilling flat sharers, also have a series of stand-out comedy moments. 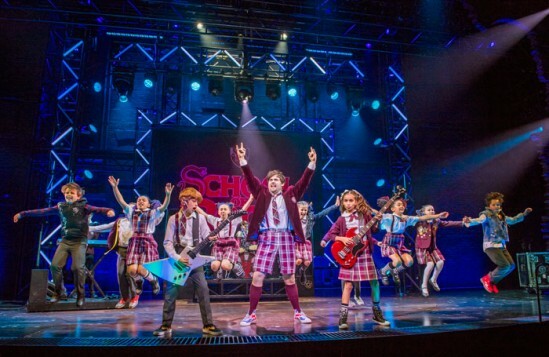 As with the kids, the London cast gives the Broadway originals a serious run for their money, slipping into the American rhythms of this story with effortless ease and panache. It’s a refreshing fact of West End life that it’s now impossible to tell the difference between the standard of the companies gracing shows on either side of the Atlantic. But it is the music that matters most, and Lloyd Webber delivers a tuneful collection of pastiche rock and charming ballads (although one, If Only You Would Listen, sounds uncannily like Someone Else’s Story from Chess, scored by Abba’s Benny Andersson and Bjorn Ulvaeus). Lloyd Webber has regularly flirted with rock influences, most notably with Jesus Christ Superstar and some twangy rock chords at times infecting even the score of Phantom of the Opera, but here he gives himself the opportunity to fully indulge that anarchic spirit. It’s not a show that takes itself too seriously, but it has a heartwarming message about the value of self-expression for children, and Julian Fellowes ‘ book is on the money about the various failures of parenting that the adults come to recognise. It is just occasionally a touch too knowing, in the way of a panto script that nods and winks to the adult audience, but this is a genuine family musical with cross-generational appeal. The show’s film origins may be betrayed by an episodic structure that moves between different locations from scene to scene, but director Laurence Connor ensures it moves fleetingly as well as with feeling; there’s a real investment in the progress and outcome of these kids. Designer Anna Louizos frames it within a Gothic-looking school that could double for Hogwarts a few hundred yards away at the Palace, and it’s lit to full rock-stadium effect by Natasha Katz. But most of all this show has tons and tons of heart, and it has been executed with a heartfelt amount of art.